Elena, Regency Research Nerd, back for more myth-busting on the history of pregnancy and childbirth. #3: Babies were born in the same ancestral bed where previous generations were born, consummated their marriages and died. No! I’ve seen this concept many times, and I can’t decide if it gives a sweeping sense of history or is just gross. Fabric was expensive and childbirth is messy. I won’t go into details for fear of offending the squeamish and scaring male visitors from the blog. So let me just add three words–“No rubber sheets”. 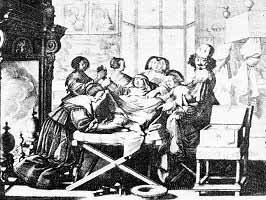 From the earliest times until well into the 19th century, most women usually gave birth in upright or semi-upright positions: squatting, standing, kneeling, sitting on the lap of a midwife or husband or in a birthing chair or stool. 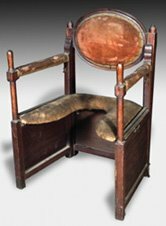 However, from the 17th century or so toward “our” period, male obstetricians (called accoucheurs) who attended ladies, were beginning to move away from the birthing chair and/or redesigning it. Ladies (as opposed to working class women) were regarded as more delicate, and recumbent positions were increasingly recommended for them. During the Regency, ladies usually gave birth in a specially designed birthing bed or cot, which was often portable and could be shared between friends. The recommended position was the “Sims” position: woman on her side, knees drawn up, doctor BEHIND her. The lack of eye contact was supposed to preserve modesty and prevent embarrassment. 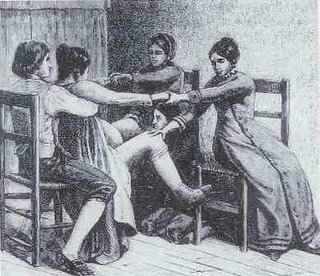 By Victorian times the “lithotomy” (on the back, legs up) position was more common, making for easier access for the doctor though not the best biological position for the woman. Conversely to Regency doctors, Victorian doctors worked under sheets by feel alone and maintained eye contact with their patients to prove they were not, um, peeking. Seems creepy to me. Thanks for indulging me, everyone! Next week: husbands in the delivery room. Elena Greene grew up reading anything she could lay her hands on, including her mother's Georgette Heyer novels. She also enjoyed writing but decided to pursue a more practical career in software engineering. Fate intervened when she was sent on a three year international assignment to England, where she was inspired to start writing romances set in the Regency. Her books have won the National Readers' Choice Award, the Desert Rose Golden Quill and the Colorado Romance Writers' Award of Excellence. Her Super Regency, LADY DEARING'S MASQUERADE, won RT Book Club's award for Best Regency Romance of 2005 and made the Kindle Top 100 list in 2011. When not writing, Elena enjoys swimming, cooking, meditation, playing the piano, volunteer work and craft projects. She lives in upstate New York with her two daughters and more yarn, wire and beads than she would like to admit. This entry was posted in Regency, Research and tagged childbirth, pregnancy. Bookmark the permalink. Really fascinating stuff, Elena! Thanks for sharing your knowledge. I’m with you on the notion of the Doctor’s hands “working” under the sheets while he maintains eye contact with the mother, Elena. How creepy!! Hmm, yeah, that does sound creepy! How’d he know if things were going wrong? Thanks for the pics! Makes things easier to visualize. Thanks for the great info, Elena! It’s an always fascinating topic.